Sometimes, I want a special dinner, which looks sophisticated like a main course from a fine dining restaurant, but which is easy to make. It took me exactly 1 hour to make this dinner, even though it looks much more complicated, due to the number of ingredients and the fact that it has basically 3 small side dishes (Polenta, Swiss Chard, Grape Tomatoes) plus mushroom based sauce. The key to the simplicity of this dinner is that the only 2 “sophisticated” parts of it are the sauce and the polenta. The rest of the dinner is pretty basic and easy to make. This is a perfect recipe for a nice, sit-down dinner. There is nothing difficult in preparing this dish, but the end results definitely looks fancy. 1) Heat oil in a large frying pan till really hot. Add lamb chops and cook, about 7 minutes on each side until well-browned, with a nice color on both sides. Use splatter screen to keep the pan open but prevent oil from sprinkling out of the pan. 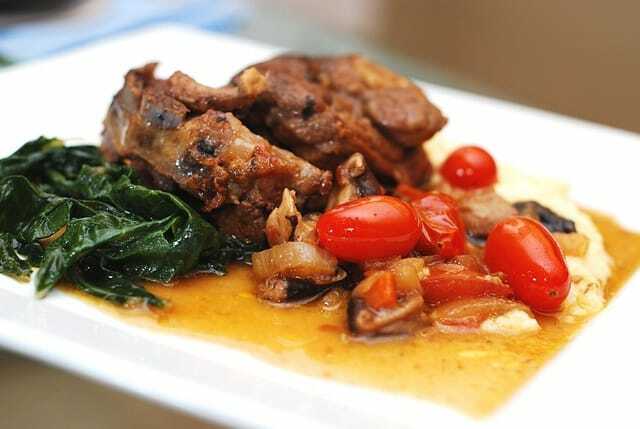 2) Remove lamb chops to a plate, and add chopped onions to the same frying pan and cook, stirring occasionally, for 5 minutes on high. Then, add chopped carrot, mix it with onions and continue cooking for 10 minutes on high with splatter screen on. 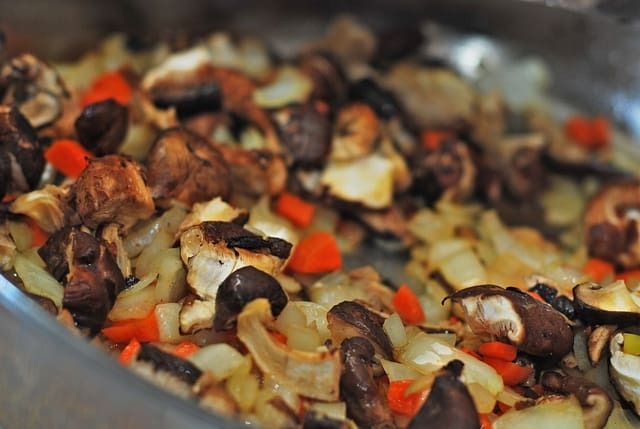 Add mushrooms, mix them in evenly with onions and carrots and cook for 5 minutes on high heat with the splatter screen on, constantly stirring. 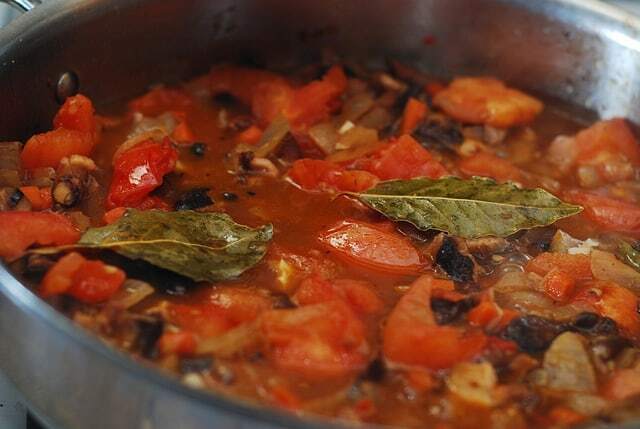 2) Add sliced tomatoes, garlic and continue cooking on high for 5-10 minutes. Salt to taste. 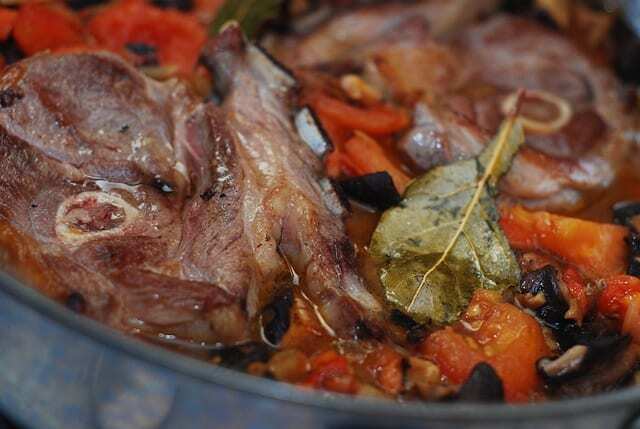 Add wine, chicken stock and bay leaves, put lamb chops back into the pan, bring to boil, reduce to simmer. Simmer for about 15, maximum 20 minutes until the blood comes out of lamb chops. At that point, remove lamb chops to a plate. 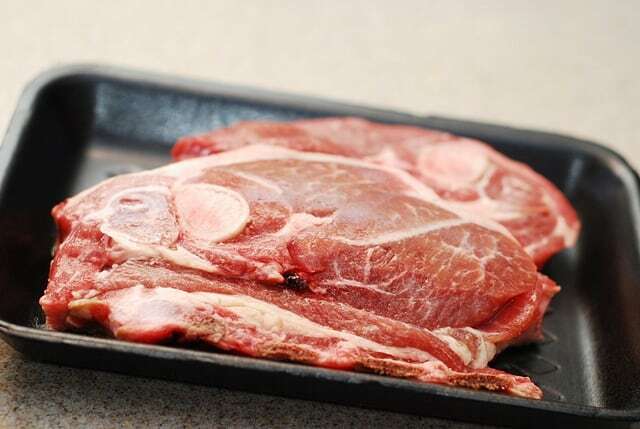 Lamb chops should be removed after about 15 minutes so that they retain more of that strong lamb flavor. Continue simmering the sauce without lamb chops for 15 more minutes, until concentrated, but not dry, watching so that liquid reduces some but does not reduce to the point where you won’t have enough for the sauce for 3 plates. Remove from heat and put back the lamb chops. 1) Place water and polenta in a medium size pan and heat until water boils, occasionally stirring and breaking the clusters of polenta. 2) Leave the pan simmering for about 5 minutes, constantly stirring, then add olive oil, milk, and keep cooking for 20 minutes, frequently stirring to avoid clumps forming and polenta sticking to the pan. Salt to taste. 3) When polenta becomes thick and creamy and soft (not crumbly) to taste, add Mascarpone cheese, mix it well with Polenta until blended, remove from heat. 4) At this point I left Polenta alone, I will add heavy cream later, when I reheat polenta for serving. So at this point, just keep polenta covered, removed from heat. 1) In a separate frying pan, heat the olive oil, add swiss chard and cook covered on medium heat for 20 minutes until the greens soften but without losing their bright color. Salt to taste. Keep warm. 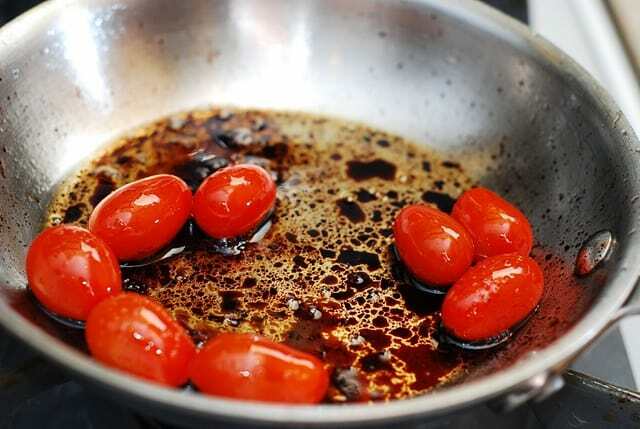 2) In a separate frying pan, heat oil with balsamic vinegar, add grape tomatoes. 3) Roast tomatoes on medium-high for about 15 minutes until brown and tender, occasionally turning tomatoes but without breaking them. I prefer not to salt grape tomatoes – they acquire an amazingly soft, almost sweet taste from being roasted in balsamic vinegar. 1) Reheat lamb chops and mushroom sauce on low heat if needed. 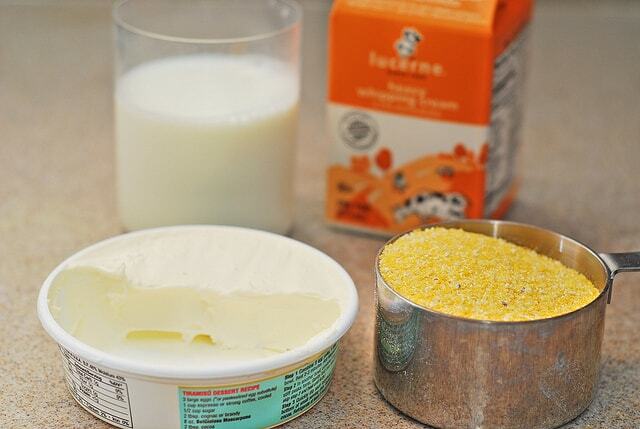 2) Reheat Polenta on medium-low heat and add heavy cream. 3) Prepare 3 large plates. To serve, spoon swiss chard on each plate on one side of the plate and polenta – on the other. 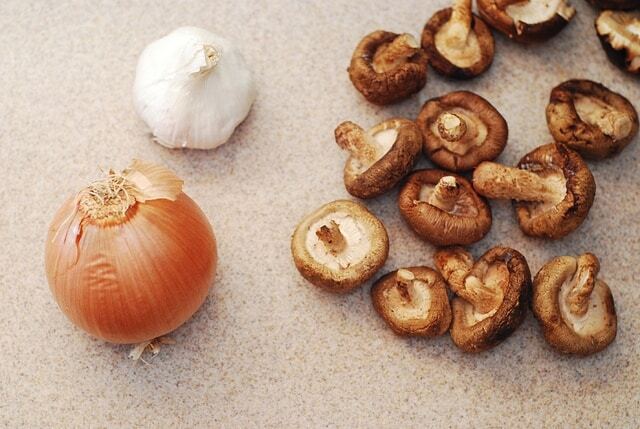 Top polenta with mushroom sauce (both vegetables and liquid). Place each lamb chop on top of mushroom sauce. Throw 4 or 5 grape tomatoes over polenta and mushroom sauce. Ready to serve! Great Recipes! Amazing site! I am looking forward to preparing these lamb chops, cornish hens and the mac n cheese. 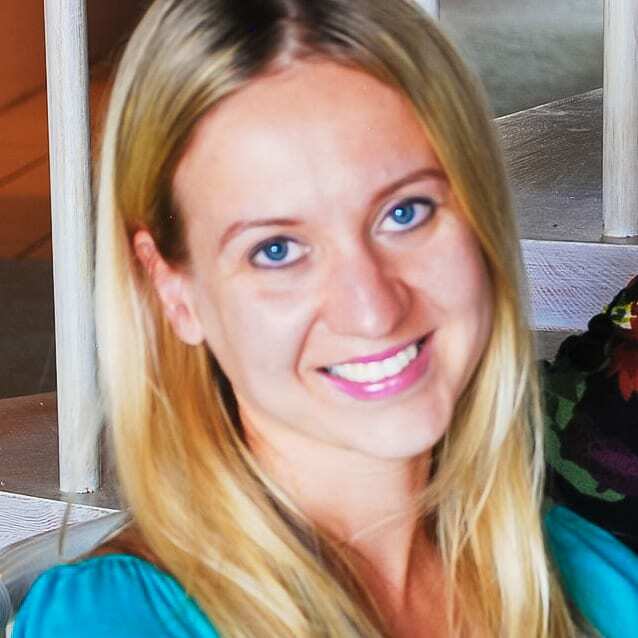 Thank you Julia for sharing! Hi Lena! Thanks for stopping by and thank you for your sweet words! I love lamb, and love serving it in a tomato-mushroom sauce over creamy polenta – just like in this recipe! Yes, that polenta can go with lots of things, not just lamb. Very easy to make, impressive to serve. It also goes well with veal shanks.